Want a really full-flavored dressing? 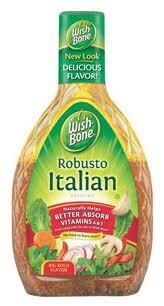 Try Wish-Bone Robusto Italian Dressing. Taken from the famous Italian dressing recipe, filled with Italian herbs and spices, and then packed full of even more herbs, seasonings and cheese flavours for a taste that's even more zesty and robust. 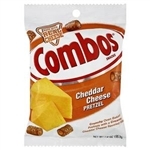 WATER, SOYBEAN OIL, DISTILLED VINEGAR, SUGAR, SALT, GARLIC*, CONTAINS LESS THAN 2% OF EACH OF THE FOLLOWING: ONION*, RED BELL PEPPERS*, XANTHAN GUM, SPICES, MALTODEXTRIN (CORN), AUTOLYZED YEAST EXTRACT, LEMON JUICE CONCENTRATE, CALCIUM DISODIUM EDTA (USED TO PROTECT QUALITY), NATURAL FLAVOR, CARAMEL COLOR, ANNATTO EXTRACT (COLOR). *DRIED.